The research group is involved in modification/functionalization of polymeric/textile substrates using indigenous developed atmospheric pressure glow discharge plasma reactor. Among the available surface modification techniques, plasma technology is gaining interest due its ecological and economical advantages over conventional chemical processing of textiles. Hydrophobic functionalization of cellulosic fabric was achieved using long chain hydrocarbon precursors having C12 alkyl chain with a different functional group attached to it, for example, dodecyl acrylate (DA, with acrylate group), lauryl alcohol (LA, with hydroxyl group), dodecanoic acid (DODAC, with carboxylic acid) and dodecane (DD, without any functional group). Treatment was carried out in-situ with in-situ plasma reaxction dynamics were significantly dependent on the kind of functional group attached to the long alkyl chain. After the treatment, durable hydrophobicity was obtained with water absorbency time of substrate increased to > 1 h in the case of DA and LA, up to 20 min in the case of DD and only up to 9 min in the case of DODAC. The energy required for functionalization was in the order of DA>LA>DD>DODAC. Our group is working on in-situ plasma reactions with different nonfluoro precursors like dodecyl acrylate, butadiene and styrene etc. 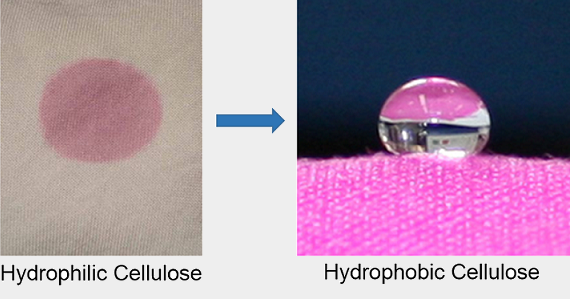 to make the surface of textile from hydrophilic to hydrophobic in nature. After the plasma treatment, surface of textile substrate turned highly hydrophobic with contact angle > 140°and drop disappearance time > 1 hour. The treatment was found to be durable in nature as confirmed after solvent and soap washing of plasma treated sample. Wool fabrics on treatment with atmospheric pressure helium glow discharge plasma showed improved felting and dyeing behaviour with cold brand reactive dyes using cold pad-batch method. After plasma treatment, the hydrophilicity of wool surface and its resistance toward felting was greatly improved without any significant damage to the cuticle layer. The colour strength of the plasma treated dyed wool on the surface (in terms of K/S) was found to be nearly double and total dye uptake was found to increases by about 40%–50% as compared to the untreated wool fabric. Nylon and polyester fabrics on plasma treatment in the presence of different reactive gases showed significant decrease in time taken in spreading of a water droplet over a pre-defined area. Surface energy of fabrics was found to increase significantly after plasma treatment. Crease-resistant functionalization of cotton fabric was achieved using acrylic acid and dodecanoic acid. The reaction of precursors with cotton was carried out in situ using helium atmospheric pressure plasma at low frequency. 40 % increase in crease recovery angle (CRA) of plasma treated samples was achieved in comparison to untreated one. Hydrophobic synthetic textile substrates have the tendency to accumulate static charge due to their low moisture regain. In one of the study, nylon and polyester fabrics were treated with plasma using He and air. After plasma treatment, significant decrease in static chare build-up and half decay time were reported. The treated samples showed good antistatic properties even after five laundry wash cycles.